The CEU Board of Trustees were treated to a special screening of documentary films by CEU students on June 24. The "Best of the Mirabaud Media Lab" event was a highlight in an intense weekend and an opportunity to engage directly with students and a new initiative at CEU. 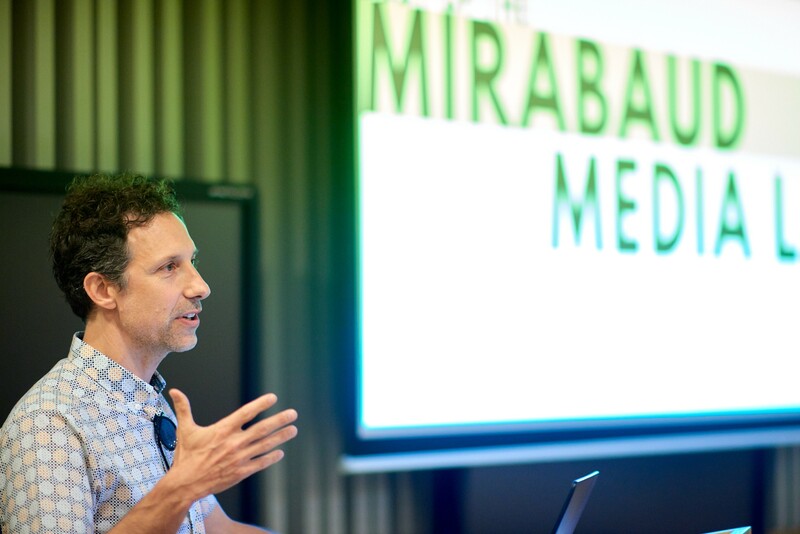 Jeremy Braverman, media and visual education specialist in the CEU Library, and the Mirabaud Media Lab’s coordinator, introduced the five featured films created in the Library’s new Mirabaud Media Lab. 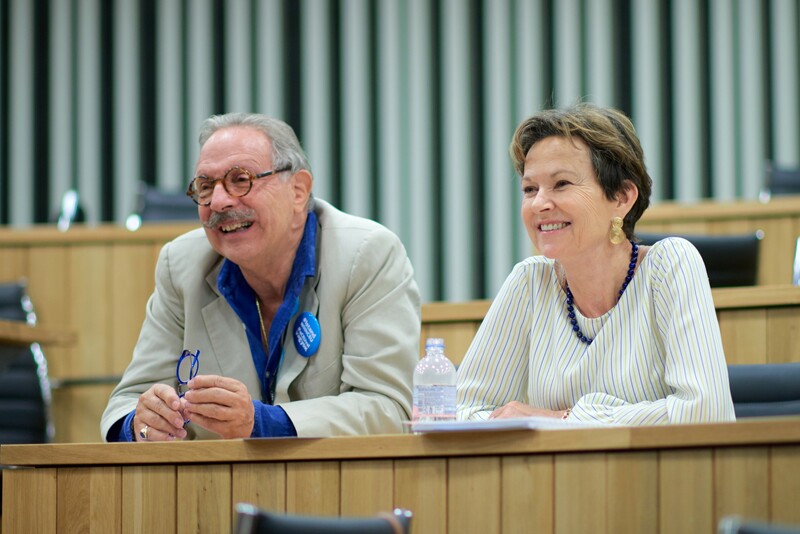 His co-instructors for two of the courses that blend theory and practice, Vlad Naumescu and Oksana Sarkisova, were also on hand. The lineup included the films “Mothers” and “Gaudiopolis: A Children’s Republic” from the Historical Narratives and the Moving Image course in the Department of History; “Lace” from the Visual Anthropology and Ethnographic Filmmaking course in the Department of Sociology and Social Anthropology; “Can a Dog Become Bacon: The Hungarian Two-Tailed Dog Party” from the Skills for Impact: Documentary Filmmaking course in the School of Public Policy; and a trailer from the Participatory Video workshop in CEU’s OLIve program. The films ranged from 5-10 minutes in length. 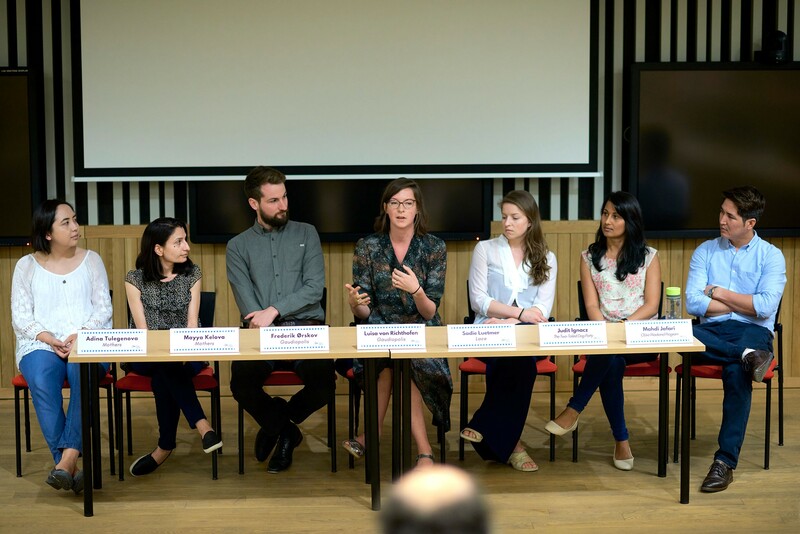 During the Q&A, one student filmmaker commented that making a documentary gave her the opportunity to learn another important method of expression beyond writing a paper, and a way to interact meaningfully with members of the Budapest community in ways that would not have otherwise been possible. Others talked about learning to rely on colleagues during production and to negotiate working in a team, very important collaborative skills. Of course, these are in addition to learning filmmaking techniques. The event also provided an opportunity to thank CEU Trustee Pierre Mirabaud, who shared the Library’s vision that media literacy, libraries, and education go hand in hand. Diane Geraci, director of the CEU Library, said it was Mirabaud’s generous gift that allowed the Library to purchase the media technology: computers, video and audio editing software, storage devices, as well as cameras, tripods, light kits and more. "The proof of the lab's success is in the footage," said Mirabaud. "Each film was moving in its own way and showed the power of visual storytelling. This is so important today, and I wanted CEU students to have access to the skills, tools, and technology to communicate in new ways. It turns out that CEU students are creative and sensitive storytellers. So I look forward to what next year's students will produce." Next year there will again be a full slate of filmmaking courses on offer through the Mirabaud Media Lab. It will also mark the launch of the new Advanced Certificate in Visual Theory and Practice, another exciting development in visual education at CEU. Further viewing: For those interested in checking out a sample of the work screened: “Can a Dog Become Bacon? The Hungarian Two-Tailed Dog Party”. Films that will be entered into festivals are not yet available publically. Work produced in the Mirabaud Media Lab last year can be found at the Visual Studies Platform’s Youtube page.